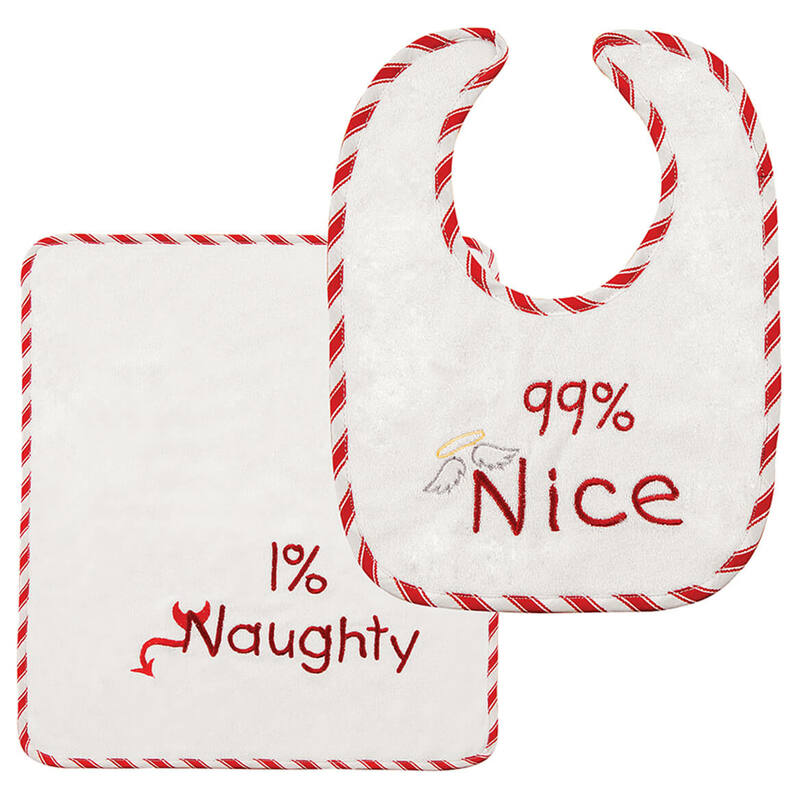 Announcing Baby’s holiday stats for Santa, this angelic Christmas bib is embroidered with “99% Nice” … while the burp cloth reads “1% Naughty”. The 99% Nice bib & burb cloth set is designed in 100% cotton terry cloth, adorned with sweet details, trimmed in peppermint stripes … and 100% fun! The bib features hook-and-loop closure for easy on/off. Machine wash cold, tumble dry low. Baby bib: 10″ long x 8″ wide. Burp cloth: 15″ sq. Imported. 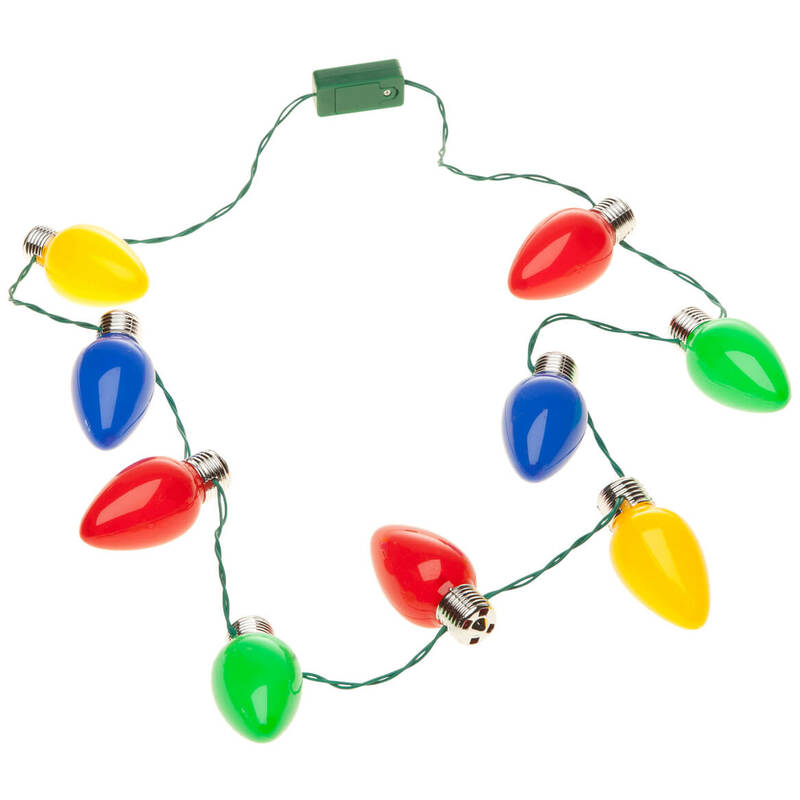 Our festive flashing Christmas light bulb necklace will add real holiday fun and flair to any outfit. Each “light” is 3/8″. This blinking Christmas light necklace has three different settings. Batteries included. 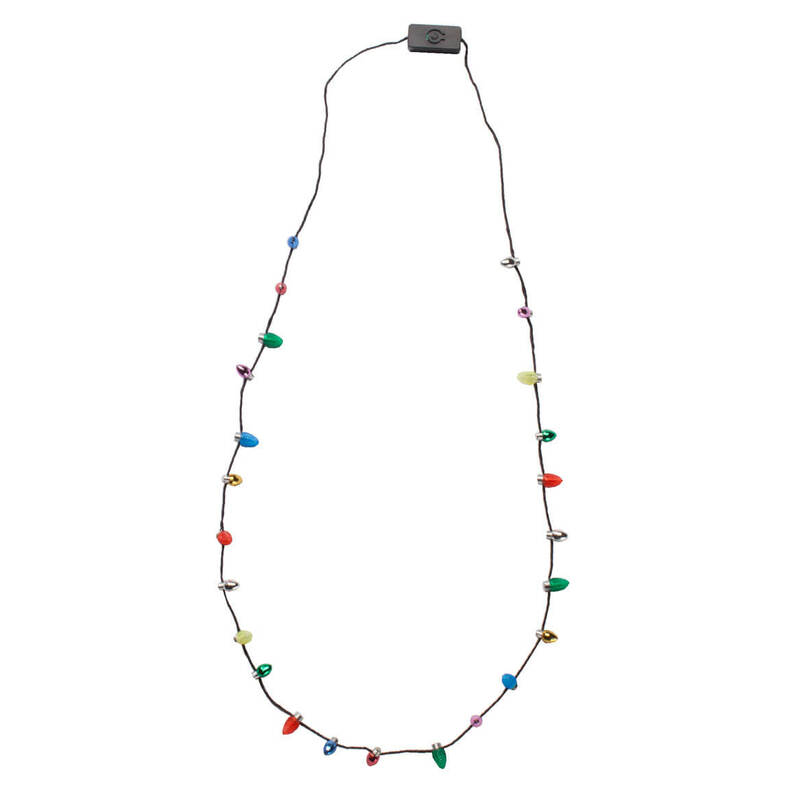 Each light up Christmas necklace is 31″ long. No express shipping. For the brightest flashin’ fashion—glow BIG in these jumbo holiday necklights! You can’t hide your festive spirit when donning this light up necklace with 9 large, colorful lights that dazzle in 3 mighty merry modes (slow flash, fast flash, constant on). 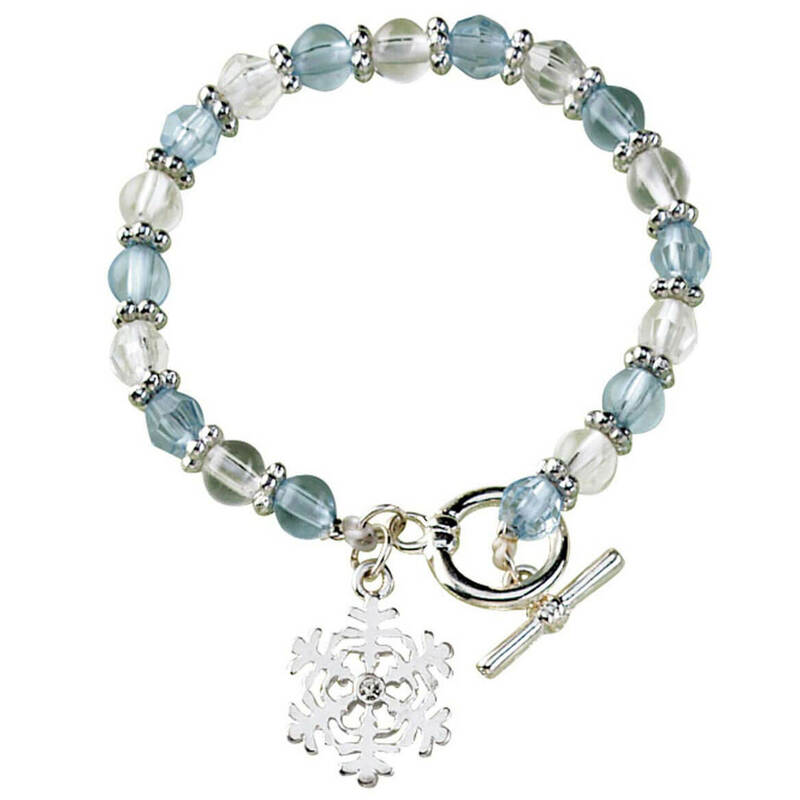 Each jolly, jumbo light measures 2 1/4″ long; Christmas necklace is 36″ long overall. Ages 14 and up. SMALL PARTS. Not for u003c 3 yrs. Lending a touch of merry fun to Baby’s holiday wardrobe, our Mommy Kissing Santa bib & burp cloth set is embroidered with the message: “Result of Mommy Kissing Santa Claus”. Designed in 100% cotton waffle-weave fabric, the burp cloth includes red and green stripes, and the baby bib features hook-and-loop closure for easy on/off. Machine wash cold, tumble dry low. Christmas Bib: 10″ long x 8″ wide. Burp cloth: 15″ sq. Imported. Adorned with a merry reindeer, the My Two Front Teeth bib and burb cloth set is embroidered with Baby’s holiday request: “All I want for Christmas is my two front teeth”. 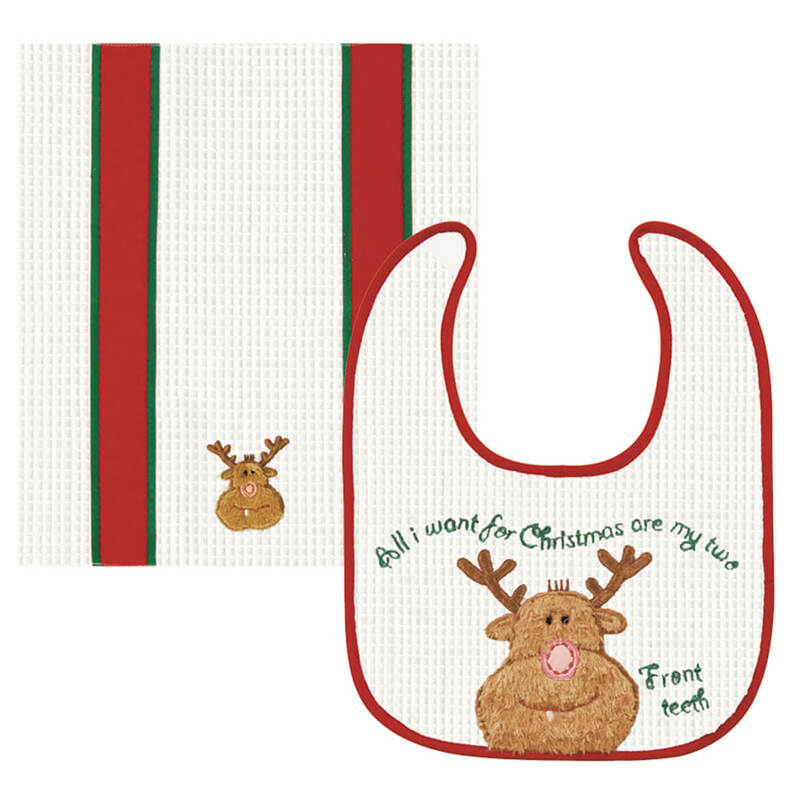 The set’s matching burp cloth features another smaller reindeer, along with festive red and green stripes. Both bib and burp cloth are designed in 100% cotton waffle-weave fabric, and the Christmas bib features hook-and-loop closure for easy on/off. Machine wash cold, tumble dry low. Baby bib: 10″ long x 8″ wide. Burp cloth: 15″ sq. Imported. Santa’s merry mail bag turns a holiday gift into a special delivery, arriving personalized for one lucky recipient! Featuring candy cane stripes in red and white, the personalized Santa gift sack cinches closed with red satin ribbons and is generously sized for wrapping a large gift or transporting several smaller ones. 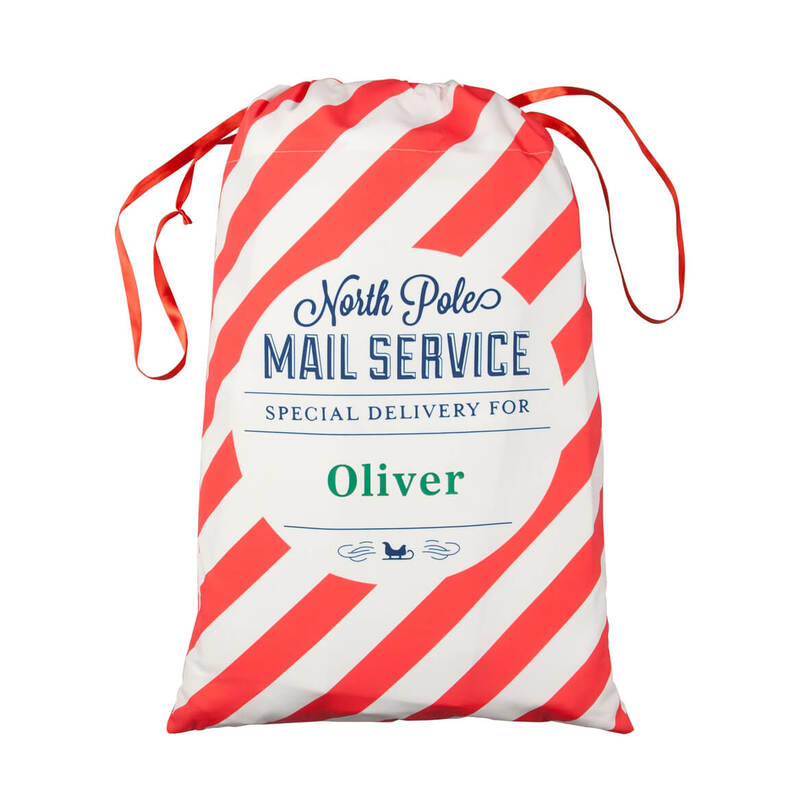 Our Santa sack is pre-printed with “North Pole MAIL SERVICE” and “SPECIAL DELIVERY FOR”. We’ll add one special name, making Santa’s surprises even more fun! Specify name; limit 1 line, 11 letters/spaces. 100% polyester; spot clean. Christmas sack measures 20 3/4″ wide x 31″ high. 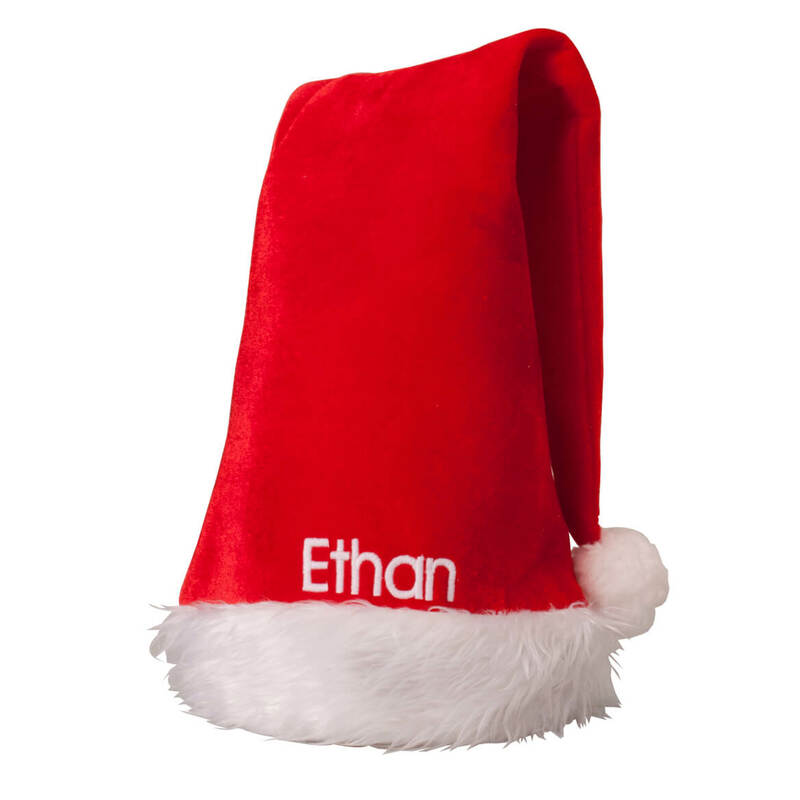 This personalized Santa hat will be specially made for one of St. Nick’s favorite friends! Destined for merry memories, precious photos and Grandma’s social media posts, the soft red hat is a holiday classic, complete with fuzzy white trim and soft pom-pom. We’ll add your favorite “elf’s” name for a custom treasure. Specify name; limit 1 line, 10 letters/spaces. Christmas hat measures 25 1/2″ long x 11″ wide; fits heads up to 23″ circumference. 100% polyester; spot clean. Imported. These jumbo Christmas earrings light up your holidays in bright dazzling style! Each fun, festive earring features an on/off switch and 3 merry light modes (slow flash, fast flash or constant on). Styled with silver-tone french wires, the pierced Christmas earrings measure 2 1/4″ long and include lithium cell batteries (non refillable). Available in assorted holiday colors (red or green); we’ll choose for you. Flash earrings made with plastic, metal and electronic parts. Ages 14 and up. SMALL PARTS. Not for u003c 3 yrs. 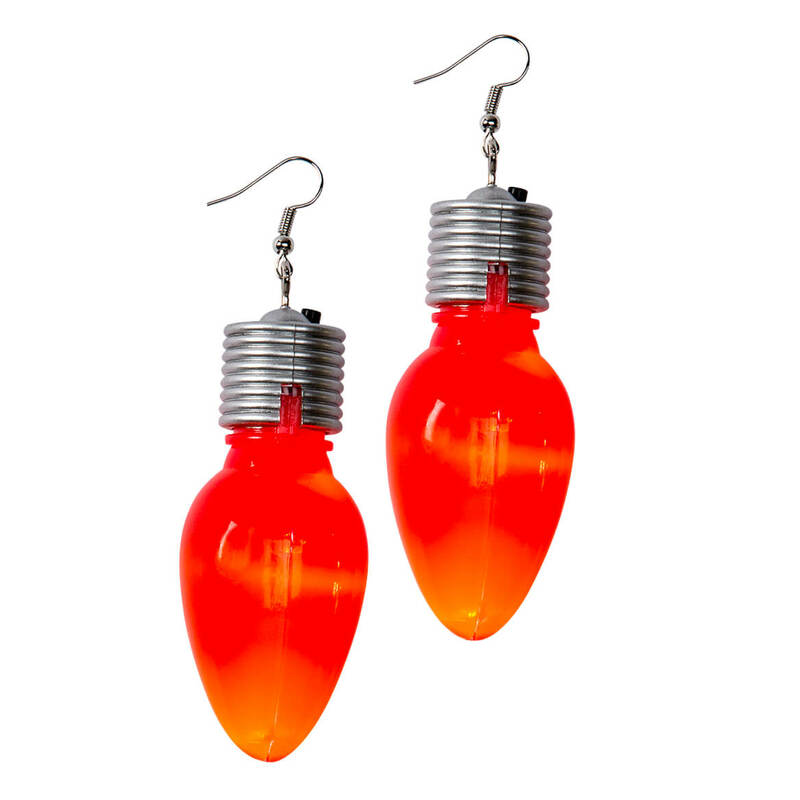 For the brightest flashin’ fashion—glow BIG in jumbo Christmas necklights & earrings! Christmas necklace with 9 large, colorful lights and matching earrings both dazzling in 3 mighty merry modes (slow flash, fast flash, constant on). 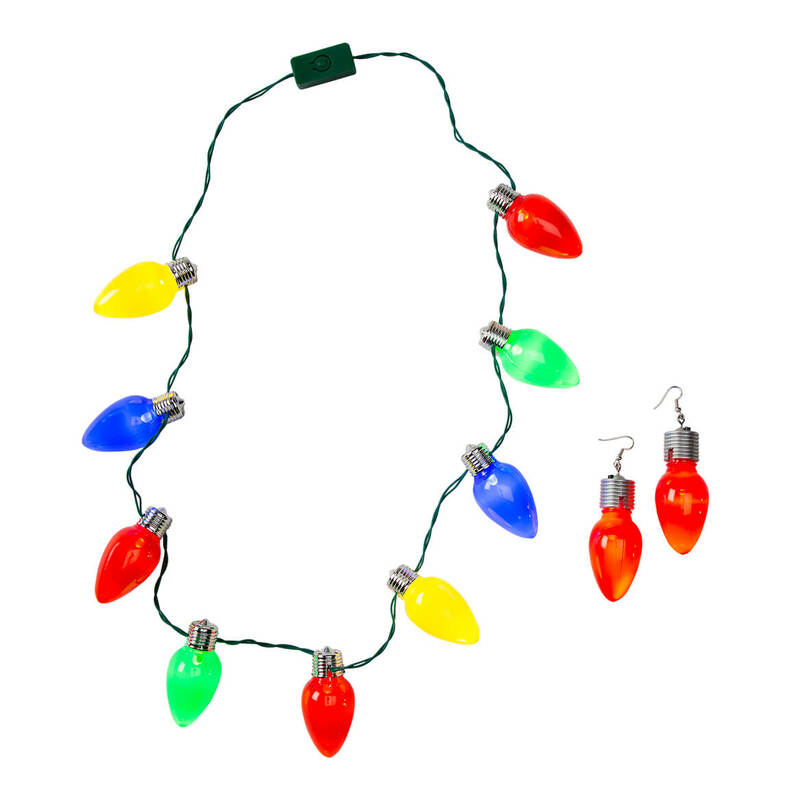 Each jolly, jumbo light bulb measures 2 1/4″ long; necklace is 36″ long overall. Pierced Christmas earrings feature silver-tone french wires, and include lithium cell batteries (non refillable). Earrings come in assorted holiday colors (red or green); we’ll choose for you. Plastic, metal and electronic parts. Ages 14 and up. SMALL PARTS. Not for u003c 3 yrs.